We daily access lots of websites over the internet related to file hosting, mail, games and many more. All these websites have their web severs through which we access them. A Web Sever is a program that allows the access of files stored on a computer to another computer over the internet. Did you ever think about creating your own web server? so that you can download files from your home computer from anywhere or you can create a web site on your own server etc. Simply said It works like this; You choose a directory on your computer, in that directory add folders, files like music, video etc. When you put the IP address of your computer the in web browser you can see all the files from that folder and you can download those files. 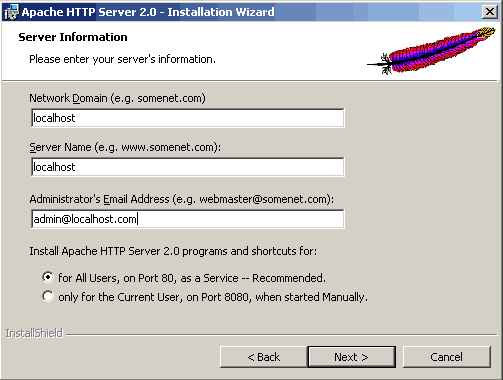 Let’s see how to create a server(HTTP server!) using Apache(a server client). Download apache2.2.10- win32-x86-nossl.msi from here and install it, set parameters, for localhost type something like myserver.com (doesn’t really matter), also type your email address in field[email protected] Email Address as shown below, choose where you want to install it. After you installed Apache , go to directory where you installed it (i.e. C:\Program Files\Apache Software Foundation\Apache2.2\conf) , here you will find a httpd file. First you have to take ownership of httpd.conf file otherwise it will not allow you to save changes to itself. Click here to know how to take ownership of any file. First, in notepad file find #DocumentRoot “C:/Program Files/Apache Group/Apache2/htdocs” and replace with #DocumentRoot “E:\MyServer”. Then find and replace with . E:\MyServer is the folder where you put files which will appear on your server. In this example I created that folder on local disc E:\ . Now press Ctrl + S to save changes to file. Close the notepad. If you want to access your own server from other computers. You must forward a port in the router you’re using. The port we need to forward is port number 80. Why? Because by default it’s the port used for HTTP. Port forwarding actually means opening a tunnel through the router so that the router wouldn’t reject the connections that are trying to connect to it. How to port-forward? With every router it’s different. Here are the instructions for every one of them. You must also turn off you firewall.